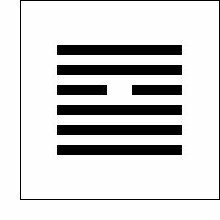 The ninth hexagram is not one of triumph or even mild success, but one of intense frustration. It’s as though we can see exactly what we hope for, and see the potential for that hope to be realized, yet also see that the hope is not realized, may not be realized in the future, and the only way that it might be realized is if we restrain ourselves from trying to realize it! Oh, those paradoxical ancient Taoists! Imagine there’s an evil, bloodthirsty king, but one of his advisors is one of the good guys. The advisor knows he will die if he tries to overthrow the king, so that’s not even a consideration. That said, the worst thing the advisor can do is try to make the king behave better by berating him or some other forceful means. It is likely that this will also get the advisor’s head on a platter (or in a bucket). But the one thing the advisor can do is restrain the evil king from murdering people everywhere by gentle and friendly persuasion. That’s it. So, as I’ve painted this utterly dour scene for you all, the I Ching actually goes on to claim that this situation is not actually unfavorable because success in the end is at least possible. It’s just that now is not the time for major operations. There are obstacles which serve to block us, and all we can really do is enact half-measures and hope that if we are subtle and skillful enough we might attain some minor influence on the times. I mean, despite the fact that I’m being a tiny bit dramatic about this whole thing, isn’t this a situation that presents itself to us all the time? Certainly, we don’t always, or even usually, recognize it. Fortunately, though we often believe otherwise, the stakes for us in ordinary times are relatively low, but couldn’t you look at your daily life, your work life, and see how often it is unwise to go for the gusto and charge on ahead instead of quietly influencing the powerful for your own benefit and to prevent them from murdering people everywhere? There are so many (or at least six) reasons to and situations in which to exercise the restraint that is so all-important to this circumstance. The simplest way to grant advice under these conditions is to say that we press forward and encounter obstructions and blockages. Pushing ahead forcibly is what we naturally want to do, but this will ruin us. Instead, we must retreat quickly to a safe place where we feel clearly that we have enough freedom of motion to subsequently go forward and backward as the time requires, and only then might we taste sweet success down the line. That in and of itself can be said to be what makes this so difficult—even the potential success is far in the future. But put it to yourself this way: maybe success in the future, or definite failure right here, right now? Again, even when you want to push on ahead, don’t needlessly bring danger and misfortune upon yourself. It’s not just freedom of motion into which you should retreat but to those around you who share a likeness of mind. There’s no admonishment here that we must be alone, and there is great number among the weak and stymied. One of the worst things that can happen here, however, is to be led into falsely believing any obstacle in front of us is beatable. In the ninth hexagram, even the weakest obstacles win. Even when you are utterly rational in your conviction that your superior intellect and/or amassed strength can overpower the blockage, you’re going to be wrong, and you’re going to be completely humiliated. Don’t fall for it. I know it seems repetitive, but I can’t stress it enough. Restrain yourself. Remain where you are safe, and strengthen yourself there. This is, after all, the Book of Changes we’re dealing with, and no circumstance is going to sit over you for very long. Wait for it to change. But while it’s still here, if you do happen to find yourself having the ear of a powerful oppressor or evil manager or something like that, don’t waste it. Be like the advisor in the initial example above, for if you find yourself in such a position, it is within your power to prevent this powerful person from murdering everyone, if you can be gentle and persuasive enough. Despite all of this, what is also depicted here is the potential for the development of true loyalty. When it comes to loyalty, there is generally a weaker and a stronger party. The weaker party participates in the loyalty primarily by devotion to the stronger party. The stronger party participates mainly by placing trust in the weaker party. Such a bond, even in difficult and frustrating times, leads to wealth and good fortune. When this “wealth” is shared, for it must never be hoarded, it increases two- and three-fold. When utterly frustrated and blocked, look for this kind of loyal relationship to form with others around you, for such are to the benefit of all and among the best possible outcomes under these conditions. Nevertheless, even when we succeed in exercising restraint and, instead of plunging ahead, gain ground bit by tiny bit, even when we claw our way to a place in which it seems success is really in sight, we still can’t depend upon it. Just at this very moment, it can be snatched from us, so we still can’t just saunter on ahead. Basically, if you think you’ve reached a time like this, the moral is that there are no circumstances in which it will benefit you to saunter on ahead. Instead, stop and be glad for what has been gained and earned. If you do so, the rest really will come in time. Even if it seems like it won’t—and it probably will seem like it won’t. In the grand cycle of all things contained within the universe, it should be expected that we will encounter places and phases and road stops we really find unpleasant. The only hopeful advice that can be given in these specific times is to use the energy and strength you do have to refine your own nature in small ways. You won’t have time to do that when the time comes—and it will—for large undertakings.